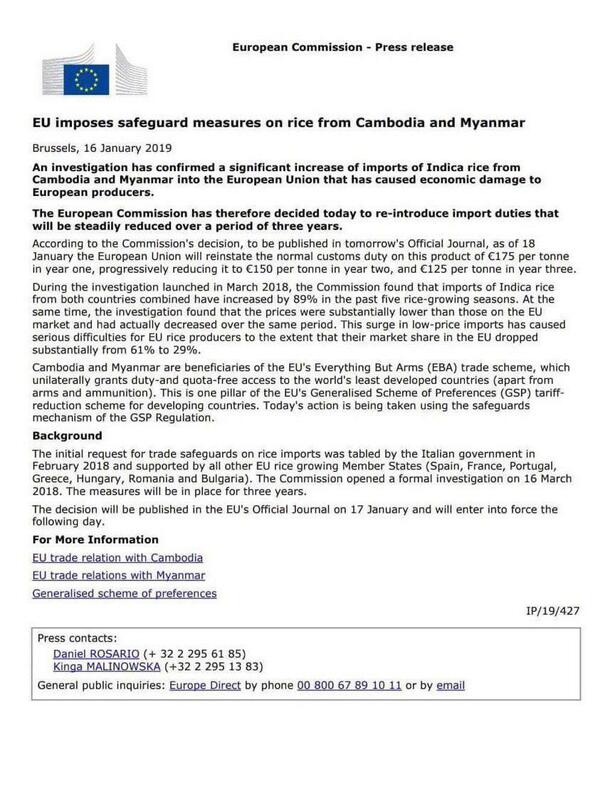 Phnom Penh (FN), Jan. 17 - The European Commission issued a press release on 16 January 2019 on the trade safeguards on rice imports from Cambodia and Myanmar. According to the Commission's decision, to be published in tomorrow's Official Journal, as of 18 January the European Union will reinstate the normal customs duty on this product of US$200 per ton in year one, progressively reducing it to US$170 per ton in year two and US$143 per ton in year three. Cambodia and Myanmar are beneficiaries of the EU's Everything But Arms (EBA) trade scheme, which unilaterally grants duty-and quota-free access to the world's least developed coutries (apart from arms and ammunition).